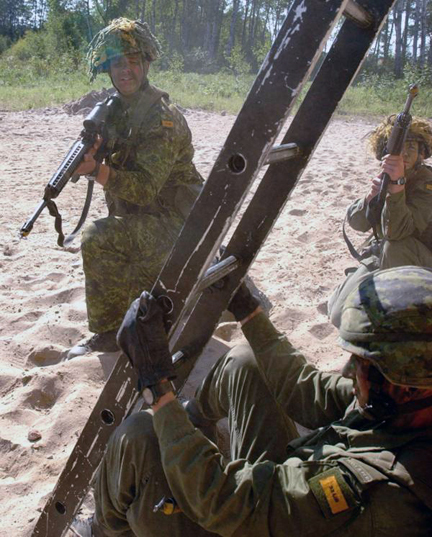 The Canadian Armed Forces Land Force Central Area embarked on a new three year training cycle for the reserve units of Ontario in 2003. The culmination of the training year was an annual summer concentration called Exercise Stalwart Guardian, held in 2003, 2004, and 2005. Exercise Stalwart Guardian combined reservists from 31, 32, and 33 Brigade Group into one formation known as 3 Light Brigade Group. The Light Brigade Group included composite infantry battalions made up of soldiers from the infantry regiments, which were designated 31, 32 and 33 Light Infantry Battalions. 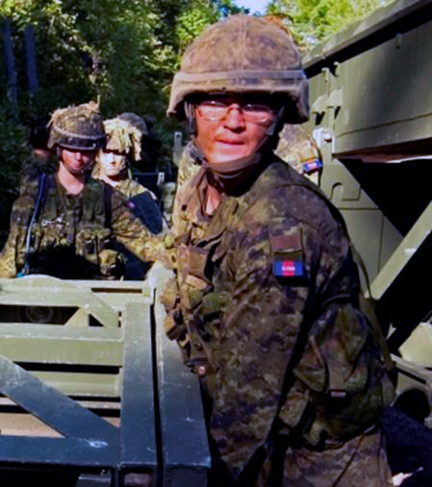 Ontario reservists from artillery and engineer units and area support units also contributed personnel to form composite operational units for the exercises. To identify these units and the exercise staff, small patches were produced to be worn in place of the nationality patch on the cadpat and combat uniforms. Stalwart Guardian 2003. A member of the First Hussars wearing the 3 CAR patch. DND photo. 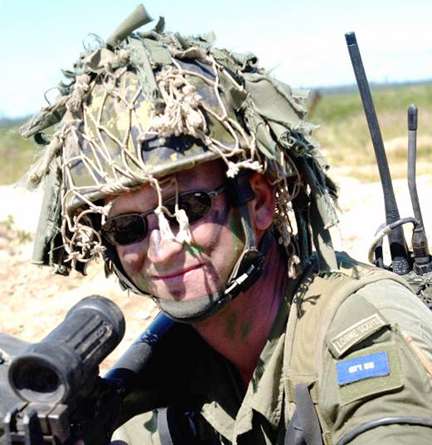 For 2003 and the two subsequent Stalwart Guardian Exercises, a series of approximately 18 identifying patches were issued for infantry, armour, artillery, engineers, signals, logistics and other supporting branches and exercise control and support staff. Some changes in the series of patches took place over the three summers of Stalwart Guardian exercises, but to date, the changes have not been documented. (For example, 3 Airborne Company was only deployed in 2003.) In 2006, the summer exercise was named Valiant Guardian. A revised order of battle resulted in several new formations and units with the respective patches being issued for Valiant Guardian concentration. The Stalwart/Valiant Guardian insignia were a hybrid formation/unit patch. These small patches identified the battalions, composite units, support units and the exercise cadre, much like a regimental or branch title. They were designed like a formation patch, but much smaller. 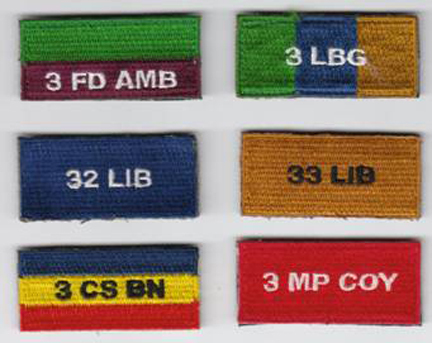 The patches had exercise unit abbreviations embroidered on different coloured backgrounds. 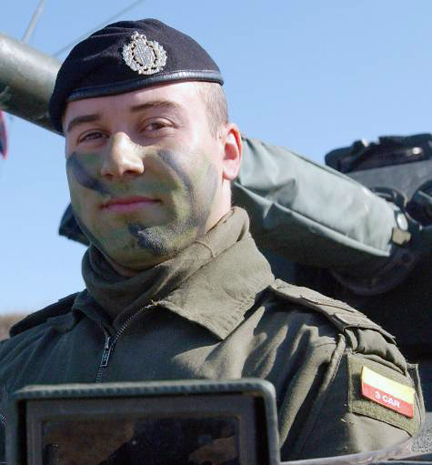 The coloured backgrounds often reflected branch or corps colours, as seen with the yellow and red of the armoured units, or the combinations of blue and red for the artillery and engineers. The patches measure 1 inch high by 2 inches wide and have a velcro backing. They were fully embroidered, most including a unit abbreviation embroidered directly on the panel. These patches were strictly controlled, with a limited issue per soldier or participant. Stalwart Guardian 2003. Members of 33 Light Infantry Battalion, including one soldier from the Hastings and Prince Edward Regiment, wearing a mixture of cadpat and combat dress. All wear the 33 LIB Stalwart Guardian patches. Credit: Department of National Defence photo. A full coloured poster titled DZ PATCES Ex SG 03 was printed for Exercise Stalwart Guardian in 2003. The following patches were illustrated on the poster, but the actual patches were constructed with the unit abbreviation imposed (embroidered) on the fully embroidered backing. Changes were made in the order of battle for SG 04 and SG 05, which changed the series of patches issued for the exercises. No poster or list of patches has been documented for SG 04 and SG 05. A selection of Stalwart Guardian DZ patches. RGE SAFETY Range Safety Black lettering on an orange panel. 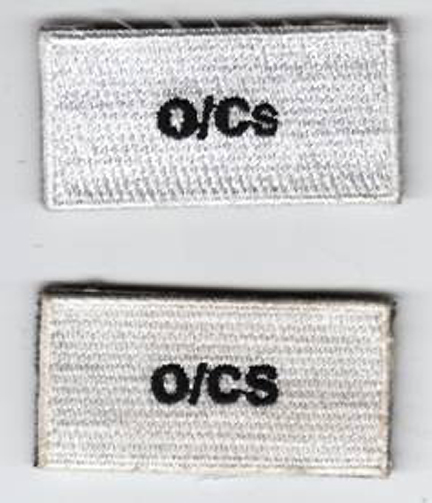 O/Cs and O/CS(note different lettering size) Observer / Controllers Black lettering on white panel. EX SP GP Exercise Support Group Black lettering on three equally divided vertical panels, from left to right canary yellow, white and orange. 3 LBG 3 Light Brigade Group White lettering on three equally divided vertical panels, from left to right, green, blue and dark gold. 32 LIB 32 Light Infantry Battalion White lettering on blue panel. 33 LIB 33 Light Infantry Battalion Black lettering on dark gold. 3 CAR 3 Composite Armoured Regiment Equal horizontal panels of yellow over red, with white lettering on the red portion. Stalwart Guardian / Valiant Guardian Observer / Controller patches. Note the different font size of the “S”. The variation is likely attributed to two different years of the SG exercises. Members of the composite 3 CER unit bridgelaying during Stalwart Guardian 2005. DND photo LC2005-026-087. Valiant Guardian 2006 Canadian Rangers patch. OPFOR Opposition Force black letters centred on a white over red patch, divided from topleft to bottom right. 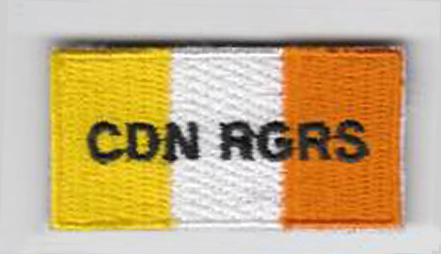 RGE/CONDUCTING/GROUP Range Conducting Group Equal white and orange horizontal panels, black lettering. You can ‘rate’ this article by clicking on the stars, below.